With the election of Sheila Dikshit as the leader of the Congress Legislature Party (CLP) in Delhi assembly today, way has been clear for her third consecutive term as Chief Minister of Delhi. The first term of Sheila Dikshit as a Chief Minister was between 1998 and 2003. She had contested the assembly election from Gole Market and won it. Thereafter, she was elevated to the Chief Minister’s post. The CBI court today fixed December 12 as the final date of hearing in the Riya Halder murder case. The court will pronounce the verdict soon. Upset teachers representing DUTA have decided to sit on indefinite strike beginning on December 15 if the government fails to announce the pay revision by December 12. A staggering 500,000 cases of dishonoured cheques — many for amounts less than Rs 1,000 — are cluttering the five courts in the national Capital, forcing judges to postpone the hearing of some to 2010. Air travellers in New Delhi had a tough time on Wednesday morning as the first fog of this winter set in, delaying over a dozen flights, but Indira Gandhi International Airport (IGIA) is yet to operate surface movement radars that are essential in low visibility conditions on its new runway. A property dealer, Surender (30), was shot at by his former colleague last night in the Narela area of Outer Delhi. In an effort to convey a global visual mandate for the formulation of effective policies on climate change, 62 countries, including India, have now committed to participating in World Wildlife Fund’s (WWF) Earth Hour in 2009. 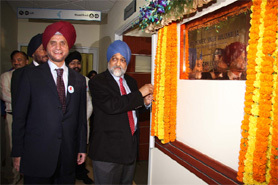 Deputy chairman of Planning Commission, Montek Singh Ahluwalia yesterday inaugurated a modern 24-hour blood bank facility at Artemis Health Institute (AHI), Gurgaon. The Delhi Metro Rail Corporation (DMRC) today got the nod from the Delhi High Court to proceed with its project in East Delhi that residents were opposing as they alleged that the land was illegally allotted for the mass transport project. With the arrest of six persons, the South district police has busted a gang of car thieves. The stolen cars were sold in various states and Nepal. Launching a new course for Delhi University (DU) graduate students, Yuvodaya, DU signed a memorandum of understanding (MoU) with insurance firm MetLife. Taking a cue from the recent Mumbai terror attack, Noida police has drawn a plan to install Close Circuit TV cameras at all sensitive places in the city to keep a tab on terrorists and criminals. Three persons hitchhiked in a call centre cab and looted it at a gunpoint. Anjani Kumar of Delhi was driving the cab attached to a call centre in Sector-59. He was coming from Delhi after dropping the employees at 11:30 pm via DND. A teenaged boy committed suicide by setting himself on fire in his North West Delhi house after he was scolded by his father, a constable in the Central Bureau of Investigation (CBI). A 19-year-old woman who was three months pregnant committed suicide by jumping from the second floor of her house in South West Delhi on Wednesday. A demolition squad of the Haryana Urban Development Authority (HUDA) today razed a score of jhuggies along Sector 17 and cleared encroachments in the shop verandahs. Celebrations started just after the observers of the meeting to elect leader of the CLP, disclosed that AICC president Sonia Gandhi had informed them that Sheila Dikshit should be entrusted with the job. This decision was taken at a meeting of the newly elected 42 Congress MLAs today to elect the leader of the Delhi Legislative Assembly. A resolution was moved by president of Delhi Pradesh Congress Committee, Jai Prakash Agarwal, who presided over the meeting. The resolution was supported by Subhash Chopra, MLA from Kalkaji. The meeting unanimously passed a resolution authorizing the AICC president Sonia Gandhi to select the leader of the Congress in Delhi assembly. When election observers spoke to Sonia Gandhi, she said that Sheila Dikshit fully deserved to become the leader of the party in the assembly and she should be entrusted with the job. Again a resolution in this connection was moved by AICC general secretary Mohsina Kidwai and it was seconded by Chaudhary Prem Singh, MLA from Ambedkar Nagar. Thereafter, all the MLAs expressed happiness at the decision and extended their support. The observers exhorted the Congress MLAs to strive for the all-round development of Delhi. The observers said that they should work hard to realise the dream of Sonia Gandhi for the total development of Delhi. Thereafter, all the MLAs and other senior leaders like Kapil Sibbal and Jagdish Tytler congratulated Sheila Dikshit. The party workers then burst crackers. The meeting for electing the CLP leader continued for more than an hour. It was a celebratory mood all around, as the workers raised slogans “Sheila Dikshit ki jai”. The 70-year-old leader, who has been in the saddle since 1998, staved off the anti-incumbency factor to pull off a hat-trick win for her party on the plank of development and good governance. The BJP, whose hopes of wresting power after 10 years were dashed, was left far behind with 23 seats. Sheila who has been elected today as a leader of the Congress Legislature Party in Delhi assembly for the third time, was appointed president of the Delhi Pradesh Congress Committee in May 1998. She led the party to a sweeping victory in the Delhi assembly elections in November that year. She repeated the performance in the 2003 assembly elections. To cap it, she repeated the history the third time. She was union minister of state for parliamentary affairs and minister of state in Prime Minister’s Office under the late Prime Minister Rajiv Gandhi during 1986-1989. She represented the Kannauj constituency in the 8th Lok Sabha (1984-89). As Delhi’s Chief Minister, she is committed to making Delhi a global city. Democratic decentralisation and people’s partnership in governance remain her major planks of administration. Development with a human face will be the cornerstone of governance with infrastructure development in the core sectors and power, transport and water being priority areas. The problems of slum dwellers and the unauthorised colonies are foremost in the priorities of her government. A cleaner Yamuna will be high on her agenda. Dikshit has championed the cause of women in various capacities. She launched the innovative ‘Stree Shakti’ programme in Delhi which entails capacity building among women, especially those belonging to the weaker sections of society. ‘Stree Kosh’ has also been set up in different localities of the Capital to encourage entrepreneurship in women. She represented India on the UN Commission on Status of Women for five years (1984-89). In UP, she along with her 82 colleagues was jailed in August 1990 for 23 days by the state government. She had led a people’s movement against the atrocities committed on women. In the early 1970’s, she was chairperson of the Young Women’s Association and was instrumental in setting up two of the most successful hostels for working women in Delhi. She is also the secretary of the Indira Gandhi Memorial Trust. Promotion of folk theatre has been one of her abiding commitments over the years. Between 1978 and 1983, in her capacity as the executive secretary of the Garment Exporters’ Association, she played a leading role in taking garment exports to unprecedented levels. Born on March 31, 1938, in Kapurthala, Punjab, she is the eldest of three sisters. Holder of master of arts degree in history, she received her education at Convent of Jesus and Mary School, New Delhi, and later at Miranda House, DU. It may be recalled that the case of the 19-year-old victim pertains to the Nithari episode. Moninder Singh Pandher and his servant Surender Koli have been accused for the murder. Earlier, the court had accused just Koli for the murder. The victim’s father pleaded before the court to co-accuse Pandher too. CBI judge Rama Jain had pronounced Moninder Singh Pandher as the co-accused on the basis of Anil Halder’s plea. Some 38 witnesses were examined from July 4, 2007, to November 11, 2008. On November 26, the defence had produced two more witnesses. It may be added that the CBI court has already accepted Moninder Singh Pandher as an accused in the murders of Pinky Sarkar, Payal, Madhu, Jyoti, Aarti and Anjali. Their cases have reached the final stage. Advocate Khalid Khan, who is appearing for the Nithari victims, claimed he had sufficient evidence to would prove his case. The Noida police had arrested Moninder Singh Pandher and his servant Surender Koli for the murder of over 20 children in Nithari in 2006. Skeletons, bones, blood-stained clothes and shoes of the killed children were recovered from Pandher’s house at D-5, Sector-31 in Nithari. The case was later transferred to the Central Bureau of Investigation (CBI). The investigating agency had registered 19 cases. The CBI has already filed chargesheets for 15 cases. The strike is expected to continue till the announcements are made. Teachers inform that the strike will be followed by dharnas and a meeting on December 19. The agitation programme will be rounded up with a march to Parliament on December 22, inform sources within DUTA. This decision was taken at a DUTA extended executive committee meeting held on Thursday. The meeting considered resolutions received from various staff associations of DU colleges which expressed resentment over the inordinate and avoidable delay in the announcement of pay revision of university teachers by the government. Based upon the suggestions received from these staff associations, the DUTA executive unanimously took the decisions which will be ratified by its general body meeting scheduled for December 12. Further, FEDCUTA (Federation of Central University Teachers Association) and teacher community in general had last month protested in a letter to Prime Minister Manmohan Singh, stating their dismay at the delay in pay revision of university teachers. While demanding immediate decision of pay revision of university teachers, FEDCUTA has demanded continuance of the existing 4 pay scales structure, i.e., lecturer, lecturer (senior scale), reader / associate professor and professor instead of 7 or 8 pay scales structure sought to be introduced by the Chadha Committee report. Strangely, the Central Pay Commission has reduced the number of pay scales from 35 to 20, while in case of teachers, the number of scales is proposed to be increased. Teachers are also demanding a pay band 4 for all readers / associate professors / teachers in reader’s grade as recommended by the UGC. The qualification for appointment of professor is ‘scholar of eminence’ and therefore to introduce hierarchy amongst them is unacademic. Further, there are also demands for timely promotion of professors in colleges, parity to librarians and other academic staff with teachers in terms of pay scales, promotions, retirement age, study leave, etc, no linking of student evaluation / peer review to promotions. In a bid to reduce the increasing backlog of cases, Chief Justice of India K.G. Balakrishnan had earlier this month inaugurated three evening courts that function for two hours on all working days. The cheque bounce cases relate to Section 138 of the Negotiable Instruments Act. Courts deal with cases where the cheque amount is up to Rs 25,000 and the complainant is a financial institution. “These petty cases pose a great hurdle in the justice delivery system. It is disappointing to have a pendency of over 500,000 such cases in Delhi alone,” Balakrishnan said while inaugurating the evening courts. He stressed that courts should not become collecting agents of money lenders and referred to Bangalore, where 7,000 dishonoured cheque cases were filed in a day. In the case of Pidilite Industries Pvt Ltd, which filed a dishonoured cheque complaint against Rajiv Enterprises, the judge metropolitan magistrate Ashish Aggarwal gave the next date of hearing for September 2010 after one of the parties did not file its reply. “Our court is so burdened with these cheque bounces cases that judges have no option but to give dates of 2010. Courts are cluttered with these petty offence files and we don’t have enough space to store them as well,” said a court official wishing anonymity. The growing cheque bounce cases have forced the Delhi Legal Services Authority to hold Lok Adalats (peoples’ court) regularly. Balakrishnan also said that 160 additional posts were being created in the lower judiciary to clear a large number of pending cases. Delhi High Court Chief Justice Ajit Prakash Shah said that of the 900,000 pending cases in the magistrate’s courts in Delhi till October, more than 500,000 related to bounced cheques, virtually choking the system. “Most of the time, courts are held up in disposing of dishonoured cheque cases. Not only this, the amount in most cases is less than even a thousand rupees. The only solution to this is an early settlement through Lok Adalats or evening courts, or else courts will end up giving dates of two years later,” said Ramesh Gupta, a criminal lawyer. Airport officials said the third runway at IGIA had been equipped with surface movement radars but they were yet to get permission to operate the equipment. As a result, the runway could not be used on Wednesday morning. About 10 to 15 flights, due to take off on Wednesday morning from the domestic airport, were delayed by 30 minutes to an hour due to poor visibility, an airport official said. The fog led to runway visibility dropping below the required 750 metres, thus affecting the flight schedules of various airlines, he said. “The visibility fell to 625 metres and only a single runway was operational in the morning,” the official added. Last week, Arun Arora, associate vice-president (corporate communications) of Delhi International Airport Ltd (DIAL), said the radars were undergoing trial and efforts were being made to get them installed before fog sets in. He also stated that everything was being done to lessen the impact of the fog. DIAL, which runs the Delhi airport, had asked the airlines to ensure that CAT IIIB trained pilots are employed on Delhi-bound flights. He has been admitted to LOk NAyak Jai Prakash (LNJP) Hospital with two bullet injuries. His condition is said to be critical. His family has lodged an FIR against Sanjay, his former colleague, and Satbir, another property dealer. The police has booked them under various provisions of the IPC. The two are at large. According to the police, the incident took place around 9 pm yesterday near DDA Flats in Sector 6 of Narela. Several rounds were fired creating panic in the area. Sumer Singh, a resident of the area, said he thought some persons were trying to rob somebody in the area and, hence, he called the police. The police admitted Surender to Satywadi Raja Harishchandra Hospital. Later, he was shifted to LNJP Hospital. Some persons who knew Surender have accused Sanjay, his former colleague, for the crime while some have held Satbir, another property dealer, responsible. According to the police, Surender and Sanjay are resident of Mamurpur village in Narela and are neighbours. They were good friends earlier and worked together but some differences cropped up between them. Few days ago they met in the marriage party of a common friend and abused each other. “Tempers flared between them in the marriage and they threatened to kill each other. However, we thought they abused and threatened each other as they were in an inebriated state. We had no idea that they would try to kill each other,” said Inder, Surender’s friend. He said the two saw each other again in Narela yesterday when Sanjay pulled out his revolver and shot at Surender. Sanjay was with his friend Satbir when the incident took place. Surender’s family has lodged an FIR against Sanjay. Meanwhile, the doctors have described his condition as critical. “He has received bullet injury on his left shoulder and stomach leading to excess blood loss. We have operated upon him. He is presently under observation in the ICU,” said a doctor. The campaign that hopes to reach out to more than one billion people in 1000 cities around the world, asks individuals, businesses and governments to switch off lights for one hour on Saturday, March 28, 2009 at 8.30 pm to create a platform of support for action on climate change. The campaign that has become a very popular platform for discussion on climate change on the Internet, started in Sydney in 2007 when two million people switched off their lights for an hour. In 2008, more than 50 million people around the globe participated. Earth Hour aims to demonstrate unprecedented solidarity and provide a visual global mandate that will put pressure on world leaders meeting in Copenhagen in December 2009 to strike a new global deal on climate change. “When leaders gather in Copenhagen in December 2009 to negotiate a new deal on climate, they must feel that the eyes of the world are upon them. Earth Hour provides an opportunity to the public to send a powerful signal that they are watching,” said Jim Leape, director general, WWF International. India has decided to join the Earth Hour. Lights will be dimmed on buildings and important landmarks in key cities of the country. Some of the most recognisable international landmarks to dim the lights in support of decisive action on climate change include England’s National Football Museum, world’s tallest hotel Burj Dubai, world’s tallest tower CN Tower in Toronto and the official residence of President of Italian republic Quirinale. Welcoming the chief guest, chairman of Artemis Health Sciences, Onkar. S. Kanwar said, “We have taken the growth of 9 per cent per annum and 10 per cent in the area of health for granted”. He talked about health sector infrastructure, need for public private partnership, adequate funding for medical care and qualified medical experts. Introducing the blood bank, CEO of Artemis Health Sciences and chief cardiothoracic surgeon, Dr Kushagra Katariya said that Artemis blood bank follows international quality standards and guidelines laid down by the European Council, American Association of Blood Banks and National Aids Control Organisation – Blood Safety Standards. These guidelines are in addition to the minimum confirmation specified by the Drug and Cosmetic Act (Indian Regulatory Authority) for blood component preparation, he added. “The blood products are prepared so that the patients have maximum benefits and minimal adverse effects of transfusion approaching the near Zero Risk Transfusions,” Katariya confirmed. According to the hospital, the blood bank has used special blood collection bags with diversion pouches, so as to minimise bacterial contamination. Moreover, special stress has been given on the removal of WBC, most common contaminant of blood responsible for adverse effects. “We have tried to recover platelets by buffy coat method, so as to enhance efficacy of platelet transfusions. Irregular antibody screening, of both patients and donor, during blood grouping and compatibility testing is done using FDA approved cell panels, to improve long-term success of blood transfusions which makes it one of the most hi- tech blood banks in India, confirmed an official. The order was passed on a bunch of petitions filed by the Ashok Nagar Residents Welfare Association. Sixteen cars, including one Tata Safari, two Scorpio, two Hyundai Accent, four Tata Indica, three Maruti Alto, two Santro, one Maruti WagonR and one Maruti 800 CC, have been seized at their instance. Various equipment used in car theft have also been seized. The arrested persons have been identified as Mohammad Shabbu (21), Mohammad Arkaan (35), Riyaz (35), Ansar Ahmed (50) and two Nepalis Mangal Paswan (22) and Vinod Prakash Chaudhary (20). DCP (South) H.G.S Dhaliwal said it was learnt on December 2 that Mohammad Arkaan and Mohammad Shabbu would come near a temple at M.B. Road in a stolen silver Hyundai Accent car (DL-3CAL-3257). A police team was deployed near M.B. Road and the car was spotted around 7 pm. The occupants of the car could not produce the desired documents. In stead they abandoned the car and tried to flee. The two were arrested. The car was found stolen from the New Friends Colony police station area. Arkaan disclosed that he along with his gang members had been involved in car theft for the last four years. The other gang members were nabbed at his instance. The MoU for the life insurance education and training programme was signed between vice-chancellor of DU Deepak Pental and Rajesh Relan, managing director, MetLife. The specifically designed programme for the DU graduate students will offer education and training in insurance sales practices, products and the legal and regulatory aspects of life insurance. The course modules would be spread over three months and would also include the job training for the qualifying students. After the successful completion of the course, the students will be awarded a joint University of Delhi and MetLife certificate. “DU is renowned for its leadership in developing and implementing innovative methods to help increase employment among the youth. As the youth define our future, it is our responsibility to ensure that our future has a strong foundation. This tie-up is one such initiative that will help provide the same,” said Deepak Pental, vice-chancellor, DU. Speaking on the occasion, managing director of MetLife Rajesh Relan said their firm was looking at hiring more than thousand people. Among the sites identified are Sector-18 market, Film City, main shopping malls, hotels, busy crossings, banks, media centres, Noida border entry points, leading IT and BPO companies. This decision was taken in a meeting of senior officers of district administration and Noida police. Senior superintendent of police R.K. Chaturvedi said a proposal for installing CCTV cameras at all important and sensitive points has been sent to Noida authority. A general alert has been sounded in Noida as it is adjoining national capital, Delhi. The Noida police has quickly surveyed sensitive areas. The police has been engaged in getting ready the blue prints of main sensitive spots for many days. CCTV cameras in Noida can play a significant role in preventing and solving terror attacks. Three persons requested Kumar for a lift till Noida near Ashram Chowk. Kumar gave them a lift thinking of making some money. As the car reached T-Series crossing at Sector-3 in Noida, the three persons pulled out their revolvers and took to the driver’s seat. They dropped Anjani and sped away. Anjani informed Sector-20 police station, who registered a theft case in stead of car loot case. Deepak, a class XII student of Indraprastha Public School, immolated himself on the terrace of his Vijay Vihar house in Sector-20, Rohini on Tuesday. His father Karamveer, a constable posted in Delhi, was summoned to his school for Deepak’s repeated misbehaviour. After returning from school, Karamveer slapped and scolded his son over the continuous complaints from school and the bad company he was keeping, a police official said. Jyoti, who had married 20-year-old Bharat Singh against the wishes of both their families six months ago, killed herself around 2:30 am at Palam. She was taken to the Deen Dayal Upadhyay Hospital, where she was declared brought dead. No suicide note was recovered. The team of HUDA swooped in Sector 17 and the anti-encroachment operation was conducted smoothly. The encroachments in the shop verandas were of recent origin. The HUDA authorities have warned of stringent action against the culprits in future. Indications are that a similar drive in other sectors of HUDA is on.